At its core, marketing is about capturing the attention of the masses. This is easy when frigid winters and extreme snowfalls make those masses a captive audience, reliant on television for entertainment and diversion. In fact, when someone mentions advertising, it usually brings to mind images of commercials on television. And while the commercial break has been a staple of TV for as long as there have been networks, the onslaught of television ads generally slows in the summer, when most people would rather be outside enjoying the weather. That’s why you don’t get new episodes of your favorite network TV shows in the summer. Shackled from their wintertime imprisonment, people are free to pursue other diversions. There simply aren’t enough viewers. Of course, modern-day marketing is not constricted to 30-second ads during television programs. In fact, modern marketers have found a wide variety of innovative ways to capture the attention of their audiences, especially in those challenging summer months. 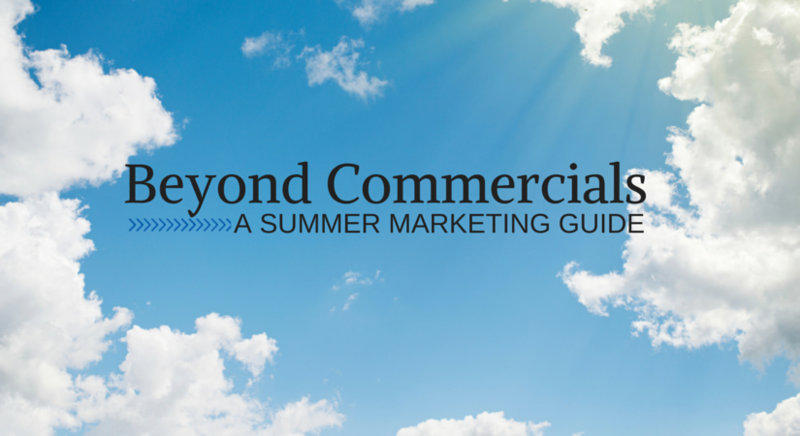 This summer marketing guide is designed to help you develop your own summer promotional ideas. The days are long in the summer, and activities are not difficult to find. Whether it’s the municipally organized little league baseball game or the impromptu family trip to the beach, people tend to be active in the summer months. This is especially true in northern states, where summers are more temperate. From Memorial Day to Labor Day, audiences tend to be mobile and active. Traditionally, marketing has relied on a somewhat sedentary audience: television viewers or magazine readers. However, that’s not the case with summer audiences. Attention: Audiences watching television have their attention mostly focused on your advertising. Yes, it’s true they might surf on the commercials or engage in conversation, but largely, audiences who are watching TV are mostly focused on that program. However, outdoor audiences in the summer time are mostly focused on other things, such as family activities and sporting events. The marketing in the summer, therefore, tends to be more peripheral. Activity: Summer audiences tend to be active. They might be sweaty, they’ll likely be hot, and they may even be experiencing a certain amount of discomfort. Think about how uncomfortable the seats were at the last baseball game you went to — not enough to make the experience non-enjoyable, but just enough to be on your mind. You can use this in your marketing to get the audience’s attention. Weather: In winter, the weather is important, but only as an indicator of impending doom: when the snow will hit and how much there will be. But the weather in summer becomes much more important: rain can ruin plans and sunshine is always welcome. Whether it’s good or bad, the forecast can change plans significantly in the summer. By tapping into something your audience is already thinking about, you can find a way to make what you are marketing top-of-mind as well. Effective marketing in the summer is best accomplished through a commitment to innovation and creativity. Indeed, your summer promotional ideas might sound crazy at first — just crazy enough to work. To get that creativity jumpstarted, we have come up with a few ways you can beat the heat from a marketing perspective. In today’s organic-crazed grocery atmosphere, farmer’s markets are a huge draw: fresh fruit, fresh veggies, farm-raised meat and more. One great way to get your branding in front of the masses is by sponsoring or co-sponsoring a farmer’s market. Sometimes sponsors are given board space for their logos. Other times, sponsors can supply branded tissue paper or bags to help with food transport. Some farmer’s markets feature live music, and sponsoring the stage is a great way to make sure your brand is not only seen, but heard as well. Of course, you’ll have to find a way to help your message rise above all of the other noise you see at a farmer’s market. After all, most people are there not to listen to your brand message, but to take in the sights of bright fruits and veggies. People may stop watching television, at least in such large quantities, in the summer, but that doesn’t mean they stop absorbing all media. Indeed, one medium that seems to increase in popularity during those summer months is radio. These days, the term “radio” also encompasses satellite radio and Internet radio services such as Pandora or Spotify. Because of these advances in technology, listening to the radio while you’re mobile is easier than ever. Many people listen while on a daily job, at the beach or even while doing yard work. This presents a great captive audience. Creating a geographically calibrated radio ad for your brand is a great way to market to a wide variety of individuals in a targeted way. Sometimes, it’s enough just to have your name out there. As mentioned above, your summer audience is likely thinking about two things: activity and weather. By placing your brand on objects that are useful and in demand, you’re increasing your brand visibility. This is usually done in a couple of different ways. First, you can put your brand name on an umbrella, an object that is especially appropriate if your brand has something to do with protection, such as insurance or home security. There are ways to make your logo or branding quite visible whether the umbrella is open or closed. And when rain suddenly strikes, people are always looking for umbrellas. Of course, when the weather is good, you might try branding another simple piece of plastic: a Frisbee. The downside is that most people won’t care about your branding immediately. This type of marketing might take a while to see a return on investment. But if you do it right, it’s a great way to get a lot of people thinking about your brand with relatively little in the way of monetary investment. Summers are known for beaches and baseball. But they’re also known for the summer blockbuster. Movies continue to be a popular source of entertainment, and event movies seem to draw ever-increasing and diversified audiences. This makes summer movies a great place to base a marketing campaign, and there are a couple of different ways to get your message out. If you’re a big business, then the sky is the limit. You pay for marketing messages to be shown before the film at nationwide chains, as Coca-Cola does before many films. Or, you can take the opportunity to make a subtler impression. Many films seek additional financing in exchange for a service called product placement. When products are placed in a film, it can have a tremendous impact on the appeal of a brand. For smaller businesses, such product placement might not be feasible. However, many movie theaters employ “pre-show” entertainment in the form of advertising for local businesses. Since summer blockbusters tend to draw large crowds, many people arrive to those movies early and are therefore audience to these many ads. Local ads generally come at a significantly reduced cost. The downside to this particular technique is that most people who go to movies are not terribly thrilled with advertisements presented at those films. For this reason, many turn their attention to their mobile phones. It can be difficult to make a connection in such an atmosphere, though it’s certainly not impossible. We live in a world of technological marvels, and it can be easy to become desensitized to those marvels. We take our mobile phones for granted, no matter how easy they make our lives. One area that seems to be relatively immune to this desensitization is aviation. For most people, the sight of an aircraft still elicits that sense of wonder we get from seeing marvelous technology in action. In other words, people still look up. And in the world of marketing, getting people to want to look at your message is half the battle. This makes aerial marketing particularly potent in the summer months, when so many people are outdoors. Of course, marketing requires that those same people who are interested in your message also be able to read your message. A slow-moving aircraft, such as an airship or a lightship, is generally the go-to solution. Known more colloquially as a “blimp,” airships have the ability to move slowly and remain over a single area for an extended period. This is why you tend to see these floating sponsorships over sporting events, where an audience of tens of thousands is generally thrilled to look up and see a message because they’re marveled by the technology. Even though that technology has been around for over a century, airships are a relatively novel sight. Messages on airships should be relatively short and confined to a simple brand, such as with the MetLife blimp. However, large LED screens can be used to convey simple supplementary messages such as Twitter handles, coupon codes or release dates. In some cases, other aircrafts can be used. For example, fixed-wing aircrafts such as airplanes are often used to carry marketing signage over populated areas. Airplanes can also easily cover a wider area. Skywriting is also a possibility, but it lacks the durability of a blimp (as skywriting is very dependent on the wind and atmospheric conditions). That said, skywriting definitely makes a huge impression and gets the attention of folks on the ground. Whatever your summer promotional ideas, turning to the sky is a great way to turn heads. When it comes to marketing in the summer, whatever avenue you choose, it’s important to have partners you can trust. If you want to advertise in film or radio, make sure the product that’s been put out reflects your brand. If you’re making Frisbees or umbrellas, you will want to sign with a production company that won’t smudge your logo. This is perhaps most important when it comes to airborne advertising. Marketing from the air is quite a logistical accomplishment. A botched message, whatever the medium, will only distract from your marketing goals. It could also result in a loss of profits and a certain amount of notoriety that can be difficult to overcome. Working with a trusted professional in the field of your marketing is a great way to ensure your message gets across in the right way. If anything is clear by now, it’s that your summer marketing ideas should be creative and should speak to your audience. Therefore, your summer marketing tactics need to be adjusted to match that audience — not only to speak to that audience, but to capture their imagination. Some summer marketing strategies are better for small businesses, while others are great for big businesses. It all depends on what result you’re trying to achieve and who you’re trying to connect with. Hopefully, this summer marketing guide has provided you with some new or interesting ideas for your own brand. Just because your audience is outside, away from the comforting reach of television advertising, doesn’t mean that audience is unreachable. Indeed, as television is usurped more every year by other forms of media, it could be that these summer marketing strategies are a glimpse into the future. Audiences demand less interference and more wow. Now that you’ve glimpsed some of these summer marketing ideas, you’re better prepared to give those audiences precisely what they want. The team at Van Wagner Aerial Media LLC has been helping advertisers stake out their claims in airspace for years. We run aerial banners, hot air balloons and, perhaps most famously, the DIRECTV Blimp, which is often a staple at sporting events. Request a free quote and download our free e-book to get started. Remember, when it comes to your creative summer marketing ideas, the sky’s the limit.